I thought I’d share one final post before Christmas. During my instrumental lessons I’ve been looking at some of the pieces that I’ll be performing and also looking a lot at technique. After looking at this, we began to explore how I actually practice and develop my technique whilst studying alone. Bryan introduced me to a system which I have found extremely useful, and I’m sure it would help many other musicians. The principal is simple and as long as you have a goal that can be broken down, the system could in theory be applied to pretty much any discipline. [I’ve drawn a diagram below to help explain]. Draw a circle and then split that circle into four sections [Diagram 1]. Each section represents 15 minutes of practice. What you want to do is decide on a goal, and think of four elements you need to consider, or four steps you need to take in order to complete that goal. For example, I wanted to improve my general drum set hand technique. 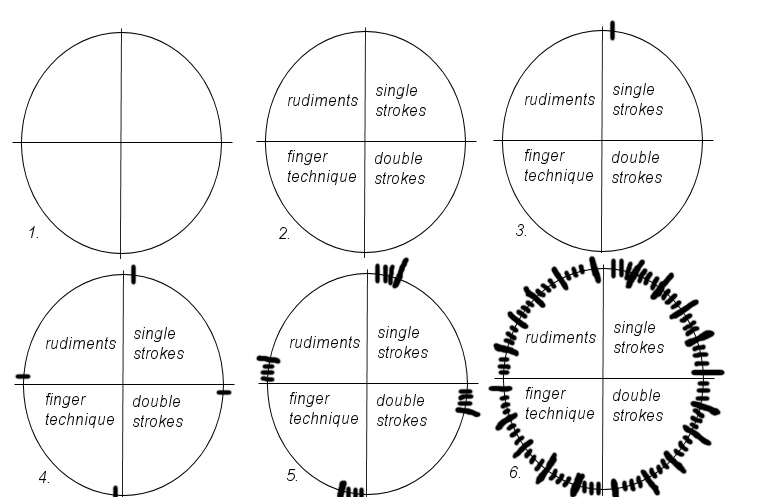 [Diagram 2] So I’ve divided my sections into ‘single strokes’, ‘double strokes’, ‘finger technique’ and ‘rudiments’ – you can apply this to your own instrument / needs and tailor the sections to suit your own goals. As I mentioned each section signifies 15 minutes of practice, so this system is designed for 1 hour practice per day. Having said that, I could also introduce another circle to work on, for example, Funk drumming, foot technique etc, and run these one after the other. Looking at the diagram, I’d practice single strokes for 15 minutes, and then draw a little line in the circle [Diagram 3]. I’d then move onto the next section, complete 15 minutes on that and draw another line in that section, and so on. Eventually you will have 4 lines signifying an hour of practice [Diagram 4]. Once I’ve done an hour on each section, I draw a larger line to mark that an hour’s worth has been done [Diagram 5]. Finally, diagram 6 shows 5 hours of practice on each section; a total of 20 hours practice on hand technique. So why do this? What is the point? Well I’ve seen quite a few benefits already, and I haven’t been using this system for very long. First of all it is a very visual concept. When practicing something like this, it is hard to keep track of how much real practice you have [or haven’t] done. You can clearly see your own progress, and personally this spurs me on to get cracking and get some more done. Secondly, the system can be changed at any point, and transformed to suit your own needs. For example, I could be going through my practice circle and decide that ‘my double strokes are sounding good now; I don’t need to do as much practice on those. I do really need to work on tap strokes though’. I could then replace ‘double strokes’ with ‘tap strokes’ and get to focus on a weaker aspect of my technique. I think the final and most attractive reason for using this system is the amount of practice you can do on something quite monotonous. For example, if I tried to practice 5 hours of single strokes, one hit of the drum with proper technique over and over for 5 hours, I’d struggle to maintain a good level of concentration. In doing this, I know I’m going to get a good 5 hours of solid practice on my single strokes. Bryan explained that after about 15 minutes of practice on a single thing, generally speaking we tend to ‘switch off’, and take less information in. With this system, you’ve got an hour’s worth of intense and focussed practice and the possibilities seem endless. I just thought I’d share that, as it is really helping me with my own practice, and it is helping me concentrate a lot more. I hope it can help others just as much as it has helped me.